South Korean securities firms are seeking to solidify their presence in both local and overseas real estate markets this year by clinching licenses as real estate trust operators while expanding territories in the overseas property market. On Sunday, the Financial Services Commission granted preliminary licenses to three securities companies. They join 11 real estate trust operators, which are all brokerage houses. The three are also the first few to obtain licenses in 10 years. The three firms are: Shinyoung Asset Trust, a company being formed by Shinyoung Securities in partnership with Eugene Investment and Securities; Korea Investment and Securities Real Estate Trust, which is being created by Korea Investment Holdings; and Daishin Asset Trust, which is being established by Daishin Securities. Out of 12 companies that competed for tentative approval, more than half were securities firms, indicating the industry’s growing interest in the real estate market. “We have been looking to expand our portfolio in real estate for some time. Real estate trust is an integration of finance and real estate, which is very appealing for us,” said an official at one of the firms that acquired a preliminary license. Analysts note that the convergence of securities firms’ original area of business and real estate will create synergy. “By becoming a real estate trust operator, it will be able to share data and necessary information with preexisting departments, including the ones that handle loans based on real estate project financing,” said Lee Kyung-ja, an analyst from Korea Investment & Securities. Meanwhile, the companies have been aggressively making investments in overseas markets while foraying into European markets that remained largely untouched, such as Scotland and Denmark. A consortium led by South Korea’s Mirae Asset Daewoo has entered an exclusive negotiation to purchase the landmark Tour Majunga building in France, worth 1 trillion won ($960 million), the firm said Sunday, which is set to mark the most expensive foreign real estate investment by a local institutional investor. 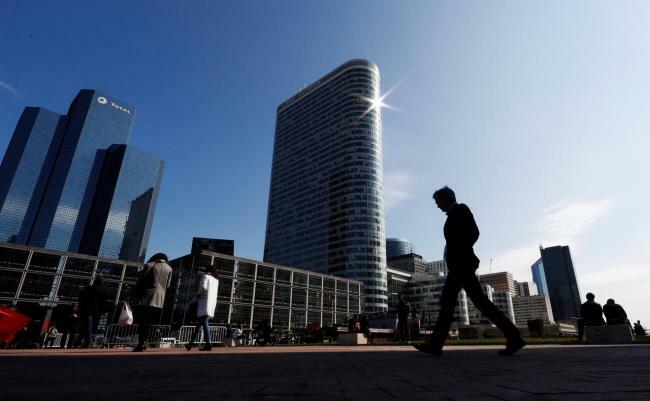 Its consortium with Amundi Immobilier, a wholly-owned subsidiary of French asset manager Amundi, was named as the preferred bidder for the building standing in La Defense, a major business district near the city limits of Paris. Mirae Asset Daewoo’s latest move follows its decision to invest 320 billion won in senior debt issued to finance the $5.2 billion acquisition of The Center, a landmark skyscraper in Hong Kong, with Singapore’s GIC. Hyundai Asset Management last month launched its first real estate fund for the $76 million acquisition of an office building leased to the National Health Service of the Scottish Government in Edinburgh. It plans to raise up to 40 billion won in a public fund between Feb. 25 and Thursday.